Harare — The arrival of Diego Costa at Chinese Super League side Dalian Yifang could be bad news or a blessing for Nyasha Mushekwi. The Spaniard's presence could relegate the Zimbabwe international striker to the bench should the 30-year-old's move materialises. Costa could take the decision by football superstars who have followed the big money of the Chinese Super League in the next few weeks. Mushekwi’s club are angling for a move to try and sign the highly-rated Spanish superstar to bolster their side in their second season in the top-flight after battling long and hard to secure their place among the elite clubs of the game in that country. Costa, who was born in Brazil but plays for Spain, has attracted interest from Dalian Yifang whose owners have a strong interest in Spanish giants Atletico Madrid. 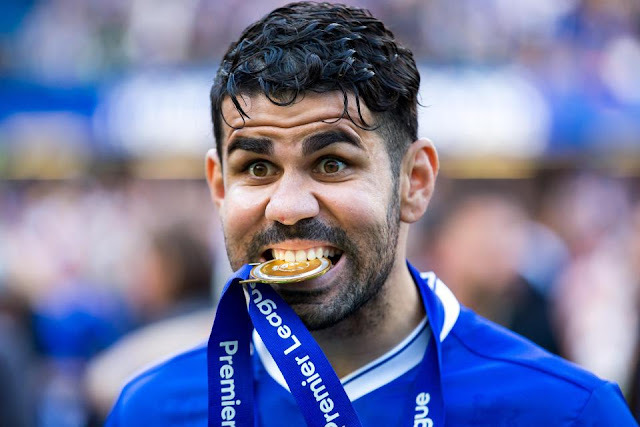 “There is a possibility Dalian Yifang could get Diego Costa, they have made him their prime target and the relationship between the Chinese club and Atletico Madrid makes this very interesting,’’ sources said. “After surviving relegation last season, the owners of Dalian Yifang, who have never hidden their intentions of creating a team that can really rock the Chinese Super League, believe some top players should be recruited and Diego Costa is a prime target for them. “The Zimbabwean striker, Mushekwi, carried a huge burden last season and had to score most of the goals and the club believes a good striker should be recruited to help him because he can’t do it alone. “Remember, even when Mushekwi had those challenges with his serious groin injury, the club could not afford to lose him, so that he could undergo surgery, because there were concerns that without him, and his goals, the club could be relegated and it’s something they didn’t want. “That is why Mushekwi’s surgery, which was eventually done in Madrid, Spain, had to wait until after Dalian Yifang had secured their place in the league at the end of the season. Costa also underwent surgery last month to deal with a foot injury and has been undergoing recovery since then. The powerful striker missed Atletico Madrid’s 3-0 win over Huesca at the weekend in which the club from the capital impressed as they warmed up for the Madrid Derby against Real. Atletico Madrid are also on the verge of signing Chelsea striker Alvaro Morata and sources said this was another indication they were resigned to losing Diego Costa to Dalian Yifang. Antonio Ruiz, a journalist close to Atletico Madrid, revealed at the weekend that Morata has already signed his contract with the Spanish giants and will be unveiled in the coming days. New Chelsea coach Maurizio Sarri gave Morata the go-ahead to leave Stamford Bridge after the Spanish striker struggled to make an impression at the club as he was dogged by injuries and poor form. Morata granted his grandmother, who was an Atletico fan, to start his career at the club. Dalian Yifang have in the past already shown they are not shy to break the bank and bring in some prominent players to their team. The Chinese club shocked the world last February when they announced they had signed Belgian Word Cup star Yannick Carrasco and Argentine midfielder Nicolas Gaitan from Atletico Madrid. Portuguese defender Jose Fonte also arrived from English Premiership side West Ham. Carrasco, who was part of the Belgian side that finished third at the World Cup finals in Russia last year, cost around £26 million to acquire from Atletico Madrid while Gaitan cost about £16 million. The two players were also reported to be on huge contracts of between £8 and £10 million a year. Mushekwi was initially pushed out of the team, because of rules where only three foreigners could be fielded, but the Zimbabwean forward — a crowd favourite at the team — forced his way back into the side after a change in the coaching department. The Warrior duly delivered for his club as he scored 15 league goals, the 10th best figures in the race for the Golden Boot, even when he played far fewer games than others and was the fourth best African striker, in terms of goals scored, in the league. He even scored more goals than Brazilian star Hulk (13) and Oscar (12) whose club Shanghai SIPG were eventually crowned champions of China. Odion Ighalo, the Nigerian World Cup striker, was the best performing African star, in terms of goals scored, in the Chinese Super League with 21, six shy of Golden boot winner Wu Lei of Shanghai SIPG.